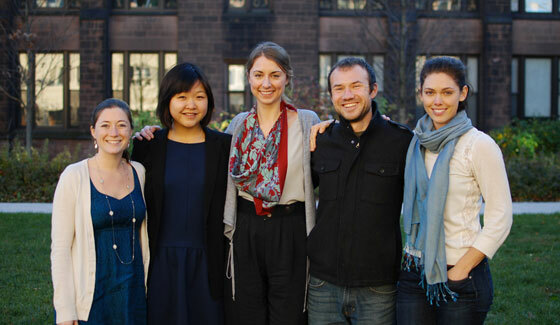 Yale graduate students attending the Winter Olympics next month in Sochi, Russia, hope to shine the world's attention on climate change and its global impacts. In less than three weeks, five graduate students will leave the campus of Yale University in New Haven, CT, bound for the Winter Olympics in Sochi, Russia. All students at the Yale School of Forestry & Environmental Studies, FES, they seek to inject a bit of climate reality and awareness into a vehicle having extraordinary access to the global population … but also focused on issues not routinely associated with the warming climate. They’re not going after gold, silver, or bronze, but they are going with their eyes fully open that they’ll face some Olympic challenges in their efforts to draw attention to the climate change in the midst of the Olypics hub-bub and goings-on. The students — Diana Madson, Tom Owens, Taylor Rees, Bo Uuganbayar, and Kaylee Weil — took time from their holiday semester break and pre-Sochi preparations to respond to questions posed by The Yale Forum, which will continue to be a platform for describing their activities during and after their Olympic experiences. The Yale Forum: Can you briefly describe the initiative you and your Yale student colleagues have in mind for using this year’s Winter Olympics in Sochi as a vehicle for informing and communicating about climate change? Diana Madson: The five of us put together “Team Climate” with the goal of leveraging the Sochi Olympics as a means to communicate the issue of climate change. We are trying to reach an audience that doesn’t come to mind when you think of climate change: sports fans. Climate change is transforming mountain landscapes. There is less snow, more rain, and shrinking glaciers. So winter sports enthusiasts across much of the world are losing their winter playgrounds. Athletes are especially aware of this reality as they spend their year traveling to mountains around the planet to practice their sport. Through our project, we are giving athletes an opportunity to share their personal experiences of climate change with their fans. Ultimately, we hope this knowledge will inspire a new audience to prioritize meaningful climate change policy. The Yale Forum: How many of you are involved in this project? How many will travel to Sochi, and for how long? Kaylee Weil: There are five masters students from the Yale School of Forestry & Environmental Studies involved in the project — Diana Madson, Taylor Rees, Bo Uuganbayar, Tom Owens, and me. We will be in Sochi from February 7 — February 15. The Yale Forum: What specific communication activities do you plan to engage in while you are at the Olympics? And what media and platforms will you use? Taylor Rees: This whole project has been an incredible learning experience for all of us. Over the past seven months, we have researched and discovered different ways to insert the climate change narrative into media platforms, from social media and blogging, to sports networks and magazines and major newspapers, to small-town journals and magazines, particularly those serving areas where our Olympics athletes grew up or live now. But the truth is that we are still figuring out how we can be most effective, and where our reach will really extend. We plan to blog and promote stories on our own website (teamclimate.com), Facebook, Instagram, and Twitter, and also connect with a variety of traditional journalism outlets to help get the story out there. The Yale Forum: Is this for-credit academic work? If so, for what course? Bo Uuganbayar: The “Team Climate” project came to fruition in a Forestry and Environmental Studies seminar in September. The class, International Organizations and Conferences, is taught by Professor Gordon Geballe. We will also be receiving independent study credit in the spring semester for the project. The Yale Forum: What are the audience(s) you are targeting for your communication activities? Tom Owens: We are targeting the average Olympics viewer. The Olympics serve as an incredible opportunity for the world to unite behind a common thread of global collaboration and peace in the spirit of athletic competition. We know it’s a big challenge, but we recognize that same spirit can draw the global community together to tackle climate change. We hope to draw links between climate change and winter sports so global viewers will realize the importance of climate change impacts on winter sports and the need for immediate action. The Yale Forum: What are the specific goals you hope to accomplish while in Sochi … and afterward? Leverage global advocacy partnerships through the Global Call for Climate Action to spread the climate change stories at the Olympics. The Yale Forum: How is your group project being funded? And by whom? Bo Uuganbayar: Our project is funded from a variety of sources, from FES and beyond. We are receiving funding through the class (Leitner Family Fund) as well as the Yale FES Field Trip Fund. We also received funding from the FES Catalyst Fund, chosen by the Dean of the School. We applied for several grants and received outside funding from the Thornton Foundation. The Yale Forum: You all acknowledge the scope of the challenges you face. Is it realistic to anticipate that climate change issues can attract attention during the Olympics given the likely buzz about these sporting events and outcomes themselves, and recently even some increasing concerns about security? Why are you hopeful or confident on this point? Kaylee Weil: I think the Olympic games attract attention for many reasons. The reason might be the sporting events themselves, gold medalists and their story to the podium, human rights issues, weather issues, and, as you say, security, etc. Sochi is going to be abuzz with stories beyond the games themselves. In the past several weeks, there have been numerous articles written about climate change in conjunction with the upcoming Olympics. During the games, it’s not the “story of the day” but the “story of the hour” that gets coverage. I’m hopeful that the climate change issue will be one of those stories. The Yale Forum: Do you plan to enlist and use Olympics sports “personalities” in your communications campaign? Who, and how did you choose and enlist them? Taylor Rees: Contacting athletes has involved a mix of approaches. I have been rooted in the outdoor community for a number of years, and have some contacts, but a lot of this is ad hoc. We have compiled lists of Olympic hopefuls, and hit them up from every angle: Facebook, e-mail, contacting their agents, asking “friends of friends,” etc. The athletes are not just a tool, or a voice in our stories. We really believe that as young folk ourselves, we can listen and relate. We want to help them tell their real stories. Sometimes these stories fit well with the “pro climate action” campaigns, and sometimes they don’t. That’s okay. Dealing with hypocrisy is okay. We want to create an inspiring space where these athletes can speak openly about their experiences and perceptions of climate change, the things they know and the things that confuse them. And we want to craft stories that color the canvas in new and surprising ways. The Yale Forum: What do you see as the “best-case” outcomes of your project? What “worst-case” outcomes do you fear, and how are you going about avoiding those? Tom Owens: We want to see the Olympics go successfully for the athletes, their support staff, and the fans. We already know the worst-case outcome. It is that the global community never responds to avoid catastrophic and costly climate change. The best outcome would be that the Olympic games launch the global community to recognize the real-world impacts of a changing climate. We hope to carry the voices and stories behind climate change/winter sports to outlets that can reach broad and diverse audiences. If we are honoring those stories and Olympic voices with journalistic integrity and honesty, then we will have achieved our goal. The Yale Forum: How can interested parties keep abreast of your activities before, during, and after the Olympics? Kaylee Weil: Anyone interested can follow our activities, blog posts, pictures, interviews, etc. on TeamClimate.com. We will also be live-tweeting from the event @TeamClimate, posting photos on Instagram @TeamClimate, and updating our Facebook @ Facebook.com/TeamClimate.